Many of you have been journeying along with me as we walk through the Breaking Fear fall bible study. Tomorrow’s topic covers how to break out of living in fear over what happens to those we love the most, our parents, our spouses, our siblings, and more than anything (for me) our kids. My dear blogging friend has come up with a key tool toward moving us toward breaking fear over our children: Learning Scripture! As a young mom, I learned there was far more to parenting than getting my children to act right. When my kids were young it felt like I was always correcting them, refereeing fights, and trying to keep the peace. This is certainly par for the course for a momma of three under the age of five, but I couldn’t help but think I was missing something. Time outs and reward systems occasionally worked, however I wanted my children to be motivated out of love and a heart to please God rather than fear of punishment. But how could they make Godly choices when they didn’t know what the Bible said? * Sing it – Words are remembered better through music rather than speech. Just listen to your child sing EVERY word to opening song of their favorite TV show and you’ll see what I mean. Many of the songs I enjoy listening to in the car or at home include lyrics straight out of the Bible. My kids get so excited when the memory verse we are learning echoes a song they already know. * Read it – The more you read something, the easier it is to remember it. My kids and I like to read our memory scriptures together in the car on the way to school. Sometimes we take turns going around in a circle, each saying one word from the verse until we’ve said the whole thing. We do it either by reading it or reciting it from memory. To help us out with this, I wrote the Bible verse down on index cards. * Pray it – In my own prayer life, I developed the habit of praying God’s Word. When I came across a Scripture that addressed a need or concern I had, I inserted my name or the specific details of my situation into that verse and prayed it. 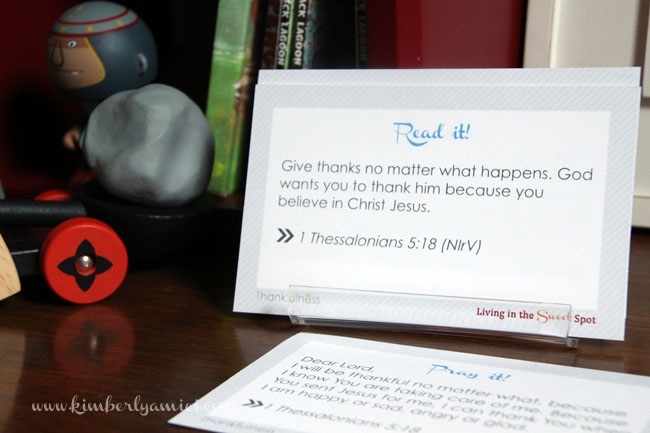 My kids have learned to do the same because I turned our memory verses into prayers and wrote them on the back their cards. As long as the need persists, we pray, and over time we can’t help but memorize the corresponding scripture. When we put all three of these together we have a simple yet effective formula for scripture memory. It’s been so amazing to see the spiritual growth of my kids because the Word of God has been planted in their heart. My kids now make better choices. Not only that, I have witnessed them rely on God when they need His wisdom, peace, or strength. The cards I mentioned are free to download on my blog. However, if you prefer the convenience of receiving these cards professionally printed, trimmed, and delivered to your mailbox, you can purchase them in my Etsy shop. Choose from a variety of topics or purchase the Starter Set that includes all 48 cards shared on my site. You can also find new scripture cards available in 3 month, 6 month, and 1 Year subscriptions available in the form of a digital download or printed product. Kimberly Amici is a writer, designer, and community builder whose desire is for hearts to be healed, minds to be renewed, and women to be connected in fellowship. She is known for her creativity, strong faith, and commitment to living life with purpose and passion. 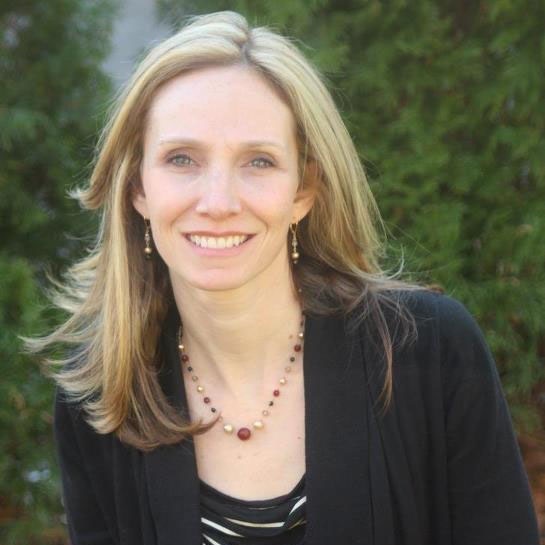 She is the co-founder and managing editor at Circles of Faith and a writer at Faith Gateway. She also blogs at Living in the Sweet Spot. Kimberly lives with her husband Carl and their three children in the NYC suburbs.